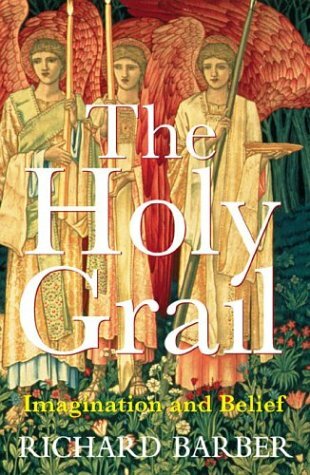 A nice overview of the grail stories, and how they fit into European history. This was part of my background reading for Tim Powers' The Drawing of the Dark and Last Call. That is as good a description of the Grail as we have. This survey of the subject defends the sensible thesis that the original Grail stories, which were written between 1180 and 1250, were closely connected with the development of Eucharistic adoration and of the concept of the Beatific Vision. The audience for these stories was a class of increasingly sophisticated knights, who wanted a transcendent ground for their careers of adventuring and their ethic of duty and loyalty. Now that's simple enough, isn't it? The great merit of this excellent study is that its author, Richard Barber, realizes there is no single key to understanding the Grail. He has written many academically serious accounts of medieval subjects for a general audience. In this work, he does the service of lucidly summarizing the major versions of the Grail story. We get accounts, sometimes necessarily speculative, of the Grail authors, and of the history of the texts that have come down to us. Just as important, Barber describes the revival of interest in the Grail in the 19th and 20th centuries, with particular emphasis on its new role in conspiracy theories of history. None of this is a debunking exercise: Barber is willing to give Jungians and comparative mythographers a respectful hearing, and he at least entertains the possibility that the “secrets of the Grail,” so often alluded to in the Grail poems and romances, may have included some spiritual exercises that bordered on “white magic.” He does, however, let us know where evidence ends and speculation begins. The chief source for all streams of Grail lore begins about 1180, with The Story of the Holy Grail by Chretien de Troyes. Little about him is known. His Story is an unfinished poem, not obviously of cosmic significance. Young Sir Perceval, who had been knighted at King Arthur's court, comes a across a mysterious castle. There resides a wounded lord. He invites Perceval to a feast, during which a procession occurs. It includes a lance, which drips blood, and a beautiful dish. (“Grail,” “graal,” “greal”: they are all variations on the word used for “dish” here: it is not a new coinage.) These objects are borne through the hall and into another chamber. Perceval had been taught not to ask questions, so he does not ask, “Whom does the Grail serve?” Had he done so, the lord would have been healed, and order would have been restored to that land. As it was, he awoke to a deserted castle. Then he began a career of aggression and cruelty, in the course of which he forgets about God. At the end of the poem, he meets a hermit, who turns out to be his uncle. The hermit explains that the wounded lord (the Fisher King) is yet another uncle. The Grail, which the hermit describes as “such a holy thing,” carries a consecrated host to the Fisher King's father, on which the old man subsists. Perceval repents. He promises to find the Grail castle again and ask the question. Meanwhile, the hermit teaches him a regimen of penitence, including some secret names of Christ that are not disclosed to the reader. Bits of this tale might be traced, but not the ensemble: the basic Grail story is as original as Tolkien's Ring story. It is barely conceivable that the motif of the clueless young knight comes from Wales. It is also possible that the Grail is a refined version of the Welsh “cauldron of plenty.” However, there is no obvious way that those elements could have come to Chretien's notice, and it is not clear how our understanding of the story would be enhanced if they had. As it stands, Chretien's account is little different from the sorts of adventures that fictional knights routinely experienced. What we do know is that Chretien's hints and omissions provided hooks for new story elements that snapped into place with lightening speed. New versions of the story said the Grail was not just present at the feast in the Grail castle, but magically provided the food. The Grail's ability to cure the Fisher king expands to the ability to cure all maladies, and eventually to confer immortality on those who remained in its presence. By the time we reach the Quest of the Grail, the chief Grail-quester is Galahad, whose spotless character and ultimate success in his endeavor is contrasted with the failure of his father, the adulterous Lancelot. The disorder of the Grail kingdom occasioned by the wounding of the king becomes the uncanny Wasteland, the suspension of the natural order while the quest is unfulfilled. In some versions, King Arthur himself becomes a Grail hero. The Grail knights achieve their quest by finding the castle and asking the right question, thereby curing the Fisher King. Then, depending on the version in question, they may take part in a Mass using the Grail, at which Christ himself is seen to be present. The Grail itself undergoes many modifications and improvements. The most important is that the Grail becomes associated with Joseph of Arimathea, a minor character in the New Testament. In Grail stories, he is said to have come to Britain, bringing various relics with him. Thus, the Grail becomes the dish used at the Last Supper, or the cup that Jesus used then, which is sometimes also the cup in which the blood of Jesus was collected at the Crucifixion. That lance, by the way, becomes the Spear of Longinus, which pierced the side of Christ at the Crucifixion. It, too, is sometimes the object of a quest within the larger Grail framework. If you want to explore the Grail stories, there are two versions to start with. One is The Quest of the Holy Grail , an anonymous prose work in French from about 1220-1230 (actually part of an extended romance called The Lancelot-Grail). The other is Wolfram von Eschenbach's epic poem, Parzival, from about a decade earlier. The Quest is the basis, more or less, of later Grail stories in French, and also of Sir Thomas Malory's Le Morte d'Arthur. (Written about 1470, it was one of the first books printed in English.) King Arthur's Round Table in the French and English stories might seem like an Order of the Grail, but if so, the Order is ephemeral: the beginning of the quest is often the beginning of chaos. Their Grail is generally a plate or cup; it might appear in several such guises in the same story. Some of these ideas are not self-evidently orthodox, and conceivably they came from a theological underground. I for one would suggest that Barber pays too little attention to the Grail tradition that the first bishop was Joseph of Arimathea. That would give England priority over Rome; it would certainly give Joseph's traditional seat at Glastonbury priority over Canterbury. Still, the medieval religious authorities took no official notice of the Grail stories. Several relics were identified as “the Grail,” in the sense of the cup or dish used at the Last Supper, but no one tried very hard to connect them with the Grail romances. Interest in the Grail waned with the Middle Ages. Because of the strong Eucharistic associations of the stories, the new Protestant establishments condemned the whole Grail tradition, to the extent that they knew of it. Even in Catholic countries, though, literary taste moved on to other things. It was only in the 18th century that systematic interest in the subject revived, largely for antiquarian reasons. With the beginning of the Romantic movement, the Grail reentered popular culture. It also began to acquire an esoteric dimension that, probably, it had not had before. Malory's Le Morte d'Arthur was being reprinted by the early 19th century, and soon became a favorite source for artists. There was a revival, or a reinvention, of the rhetoric of chivalry and quest, quite often in the service of movements for social reform. The immensely influential Pre-Raphaelite Movement embraced the Grail. There was great demand for murals depicting Grail themes, for instance. In France, and especially in Germany, there were parallel developments. There was a problem, though. The key scenes of Grail imagery were also often Catholic imagery. This was awkward in Protestant England when such works were commissioned for public places. It required tact on the part of the Anglo-Catholic artists to whom the subject most appealed. But it was also a problem in Catholic countries. People who might be attracted to the Grail material esthetically might also be alienated from the Catholic Church, whether theologically or politically. A trend began to separate the Grail from its obvious Christian context; or better, to show that the Grail was actually subversive of that context. Thus, perhaps inevitably, the Grail became part of the furniture of the occult revival. Already in the 18th century, the suggestion had been made that the Grail knights were really Templars. The Masons had rather favored unsubstantiated theories that linked themselves to the Templars, too. One result was that, when a vast Masonic conspiracy was blamed for the French Revolution, the Grail tradition became an object of suspicion. In Metternich's Vienna, the theory was not unknown that perhaps the plot to overthrow Christianity had been operating as early as the 13th century. The people who identified the Grail with the Templars, and later the Cathars, generally regarded the identification as an indictment. However, even paranoids have enemies. By the end of the 19th century, there were people who were attracted to the Grail precisely because they thought that subverting Christianity was a really keen idea. Of these perhaps the most flagrant was Otto Rahn, the Nazi researcher who is sometimes credited, on dubious evidence, with actually finding the Grail. What we know he did do was publish several books with titles like The Crusade against the Grail and The Courtiers of Lucifer. His argument was that the Grail legends masked Cathar doctrine. The Cathars worshipped Lucifer, understood as the liberator from the Jewish God, and the true Grail was the lost Cathar treasure. One can see where these ideas might come from. In later German tradition, the Grail is made from a jewel that fell from Lucifer's crown, and of course Wolfram himself introduced the disturbing idea that the guardians of the Grail had been the Neutral Angels, who neither rebelled against God nor remained obedient to him. On the other hand, there is no way to connect these notions with the Cathars, much less with the Grail. There is also no reason to believe that these issues, or Rahn's researches, were especially interesting to the Nazi government. Still, they are not as idiosyncratic as one might suppose. Much more intellectually serious was the attempt by Rene Guenon, one of the most influential of obscure 20th-century intellectuals, to incorporate the Grail into his theory of the Primordial Tradition. Tradition in this sense is the supposed orientation toward the transcendent that is shared by all the great religions. In their exoteric forms, these religions may be more or less corrupt, but Guenon suggested, along with other occultists, that the Grail stories might have been created by an esoteric Christian elite. Barber does not note this, but Guenon was always looking for means in the great religions of “initiation.” Guenon claimed to be frustrated in his search for a living initiatic tradition in Western Christianity. The vision of the Holy Grail, however defined, would have done quite nicely. Eventually, though, Guenon gave up on Christianity, and became a Muslim Sufi. One of Guenon's disciples, Julius Evola, undertook to create, or recreate, an anti-Christian elite. Evola argued, along with Dante, that the Holy Roman Empire was a divine institution, and essentially the European expression of the primordial archetype of universal dominion. Unlike Dante, he dismissed Christianity, in both its contemporary and historical forms. Rather, Evola said the Grail represented the spirituality of the empire, and especially of a secret movement of knights and crusaders who were the true Grail knights. As a notable ideologist of fascism both during and after the Mussolini regime, he hoped to create a new Order of initiates around which the empire could form again, but this time without the Christian trappings. His success was mixed at best. The keynote poem of the 20th century was The Wasteland, a term from Grail mythology. In general, the 20th century tended to treat the Grail as an ominous symbol: Barber's survey of the literature is fascinating. The great exception he finds is the work of Charles Williams, who was a former occultist, a long-time editor at the Oxford University Press, and a friend of C.S. Lewis. He wrote several novels with Grail themes, and a major poem, Taliesin Through Logres. Barber credits Williams with doing what the medieval writers never quite managed: recasting the Arthurian material in a coherent structure around the quest, and giving the search for the Grail a universal significance. Moreover, Williams did this while returning to the idea of the Grail as the Beatific Vision, but with the added notion of the Grail as a mode under which the divine intervenes in history. Despite the great length of this review, there is much more in this book than I have been able to cover. Anyone interested in the subject must read it.